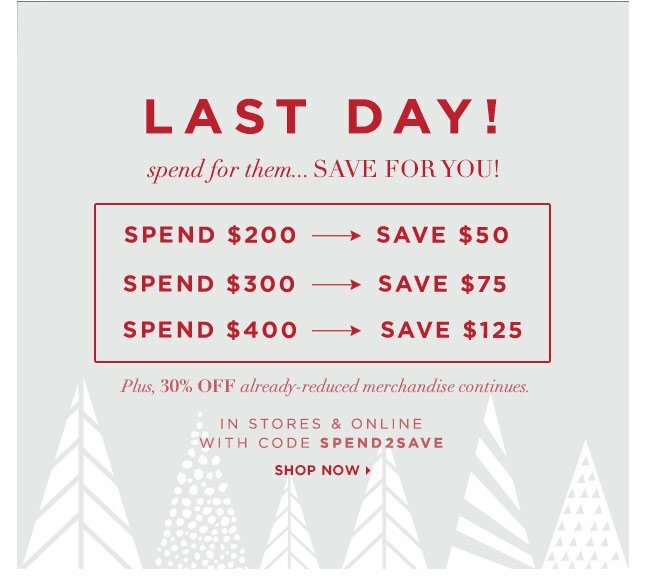 Last Day To Save Up To $125: Spend For Them, Save For You! *Free Shipping offer is valid on all orders over $150 shipped in the continental United States and applies to Standard Ground shipping methods only. The $150 threshold applies to merchandise only. Gift certificates, gift cards, taxes, and additional shipping and handling (if applicable) do not count toward the qualifying amount. Excluded from this offer are shipments to Alaska, Hawaii, Puerto Rico, US Virgin Islands, Guam, Marshall Islands, Northern Mariana Islands, Samoa and shipments to P.O. boxes. Not valid for cash. Previous purchases are not eligible for adjustments. Qualifying orders over $150 that are shipped via Standard Ground to multiple addresses will receive free shipping on all shipping destinations. Regular shipping charges apply for 2-Business Day, Next Day, and Saturday Delivery. Spend $200 or more in one transaction (excluding taxes, shipping and handling) and get $50 off your order; or spend $300 or more in one transaction (excluding taxes, shipping and handling) and get $75 off your order; or spend $400 or more in one transaction (excluding taxes, shipping and handling) and get $125 off your order. This offer is valid from December 19, 2013 through December 22, 2013 (11:59pm PT) online at ClubMonaco.com. Offer cannot be combined with any other offer other than 30% off already reduced merchandise and is not valid for the purchase of gift cards and cannot be applied to previously purchased merchandise. Discount applied to your order at checkout. This offer has no cash value. Void where prohibited by law. CODE: SPEND2SAVE. If you wish to no longer receive messages from Club Monaco®, please click here.